Beef afritada is a variation of the popular chicken afritada. Which is a basic Filipino tomato based chicken stew. Instead of chicken, you use beef. Actually, afritada is the easiest compared to other Filipino tomato based stew like menudo, caldereta or mechado. 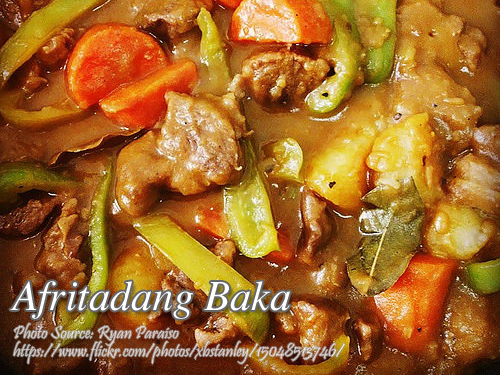 So I bet this beef afritada is an easy dish for you to prepare if you are scared to cook beef caldereta or beef mechado. Or this dish could be a good excuse if you made a mistake while cooking beef mechado because you didn’t follow the recipe and someone ask you what are you cooking? then just smile and say “It’s beef afritada!”. Beef afritada is a variation of the popular chicken afritada. Which is a basic Filipino tomato based chicken stew. Instead of chicken, you use beef. In a pot, boil the beef chunks in water, just enough to cover the meat. Cook until tender. Remove the beef chunks from the broth and set aside. Save the broth. In a saucepan, heat some cooking oil and saute garlic until fragrant. Then add onions and tomatoes. Saute until tender. Add the red and green bell peppers. Add in the beef cubes and mix well. Pour tomato sauce then followed by the beef broth. Mix well. Add the carrots, potatoes and the bay leaves. Season with patis or fish sauce and ground pepper. Simmer until the potatoes are tender. Add more broth if sauce becomes too dry while cooking. Serve hot. Hi, what kind of beef cut is suited for this beef afritada recipe? Hi Julie, beef briskets are suitable and also beef tenderloin.